The USA girls began their reign before the competition even began. As in 2011, their dominant performance in podium training foreshadowed an incredible performance in the rest of the Olympics. 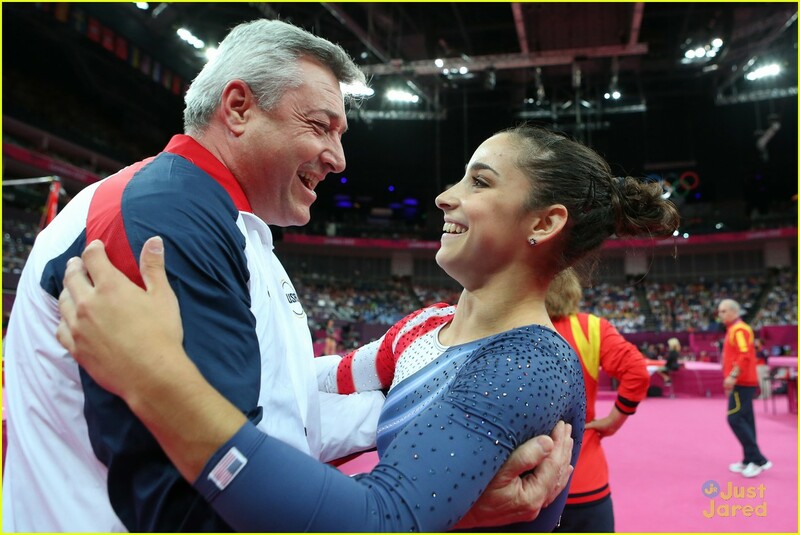 Some of my favorite moments were of course, a dominant performance on vault and Aly’s bars. I think Aly did the best bar routine I have ever seen from her that day. Pointed toes, feet together – it was awesome! And apart from Kyla’s uncharacteristic fall on beam, these girls hit every single thing they did on the floor. This is not only incredible, it is intimidating. They sent the message loud and clear that just as in 2011, they came to compete consistently and fiercely. “Always a bridesmaid, never a bride” no more for Aly Raisman, who leaves these Olympics as the most decorated American gymnast including two shiny gold medals of her very own. In today’s event finals, Aly topped off her Olympic journey with a bronze medal on beam, and that very elusive individual gold medal on floor. Finally, Aly stood on top of the Floor Podium with a gold medal, where we all knew she belonged. There were many tears of joy and moments of heartbreak throughout these Olympics. Aly had her fair share of both. Qualifying in as the first American to the All-Around finals produced both as she reached her ultimate goal and at the same time watched her best friend’s dreams crumble. She went on to lead her team to Team Gold with one of the most dominante performances in women’s gymnastics history. Tears of joy began to flow before she even saluted the judges as she was the gymnast to clinch the Olympic Team Gold. In the All-Around final, Aly was too much of a sportsman to let tears show, but I can only imagine the moment of heartbreak at missing a bronze Olympic medal due to a tie breaker (and an unusual mishap on beam). Today was a different sort of day. After watching two incredible beam routines by Sui Lui and Deng Linlin of China, all the gymnasts following knew that they had to be perfect to beat them. Even fighting for a bronze medal would require a rock solid performance. 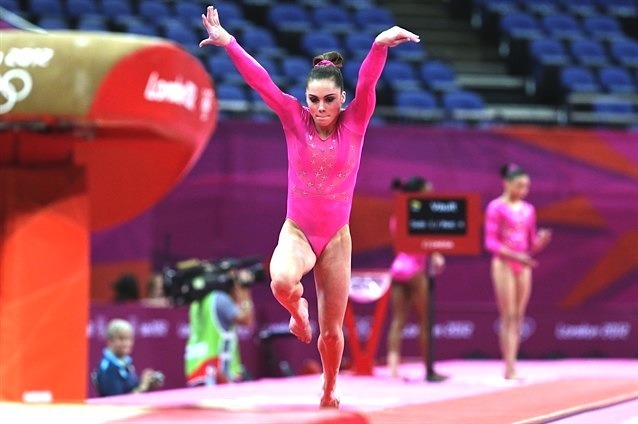 And that is what Raisman is known for- giving rock solid performances. As it turns out, her performance wasn’t up to her usual level of perfection, but it was still great. An undervalued D score, which led to a protest, which led to a tie with Catalina Ponor, finally led to a tie breaker that Aly was on the right side of. She finally escaped the vice grip of fourth place and won a bronze on beam. What a beautiful moment. But apart from a team gold medal, Floor Finals is what Aly came for. She went in to floor finals in 2010 and ended up in that ever present fourth place. 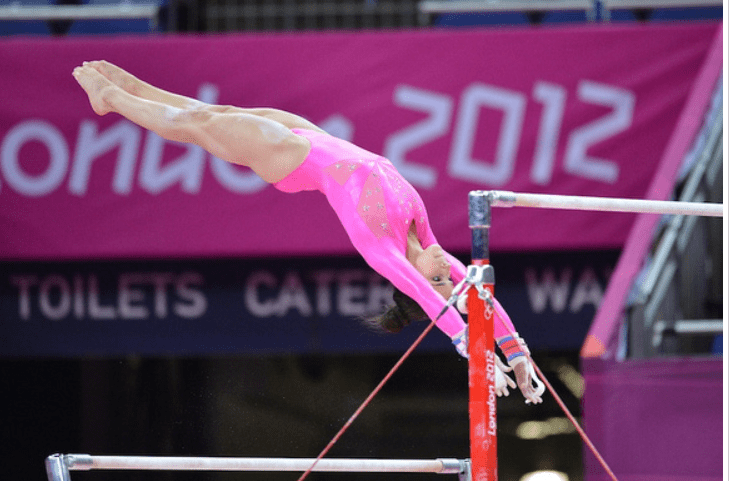 In 2011 she upgraded her routine and went into floor finals as the top qualifier. Finally winning her first individual medal, she came away with a bronze. So entering this floor finals as the number one qualifier was a familiar place for Aly. What wasn’t familiar was the performance she gave. Aly went out and did one of the best floor routines she has ever done in competition. She stuck every pass, did everything with incredible amplitude AND artistry. (For a discussion on what the code defines as artistry, and how Aly fulfills it perfectly, read here). She impressed us, she impressed the judges and she even impressed herself. In the end, Aly walked away with the gold. After all the hard work, all the almost finishing on the podiums, Aly has a gold of her very own. 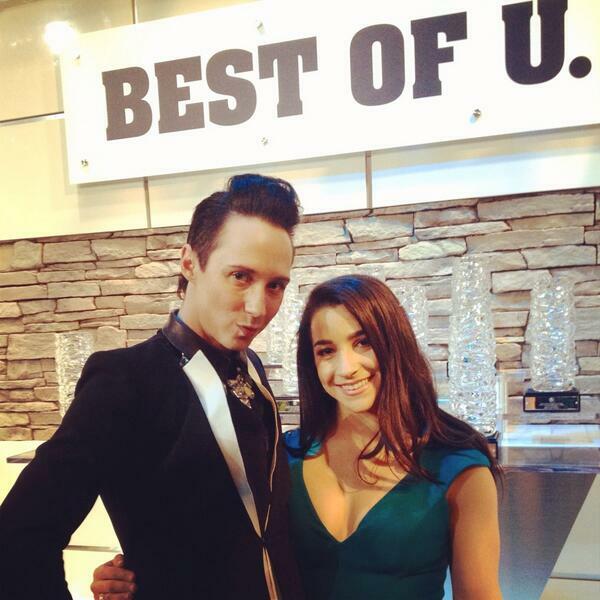 Here’s to the spectacular, never say die Aly Raisman. We are so privileged to watch you! 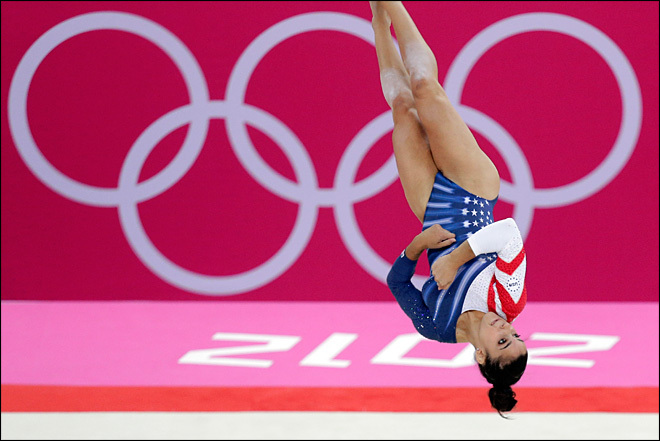 Aly Raisman, the USA Team Captain led her team to a decisive, blow out victory Tuesday night. She contributed in two ways. By performing two great routines on beam and floor and by giving leadership and her calm presence to the rest of her teammates. 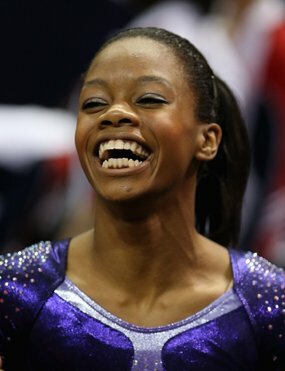 The place in the USA’s line up that was potentially the most problematic was Gabby Douglas on beam. 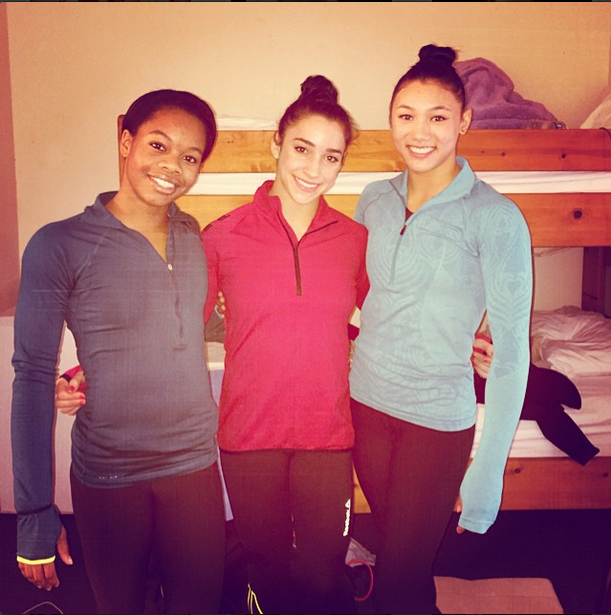 As they began to prepare for bars, Aly gave Gabby a more than a pep talk. It was almost a sergeant giving orders that must be obeyed. Nothing negative Gabby. You can do this. Do not let in anything negative. Gabby has said before that sometimes negative thoughts that she is not good enough or can’t do it creep into her mind. It is usually these thoughts that lead to her mistakes. Seems like it helped. Gabby did a stellar routine. As Aly is reaching her dreams, the steadfast demeanor she keeps in competition has begun to slip. At each milestone she has reached – making the Olympic team, qualifying into the All-Around and winning a team gold- tears of joy have sprung forth. As Aly finished her floor routine, the last thing USA needed to claim their gold, the tears began to seep out before she even saluted the judges. As they watched the score board she kept mouthing, I can’t believe this. She believes it now! Aly Raisman your incredible calm, your hard work and determination and your loving spirit have brought you to this point. Now go out tomorrow and reach your final goal – an All Around Olympic medal. We believe in you!